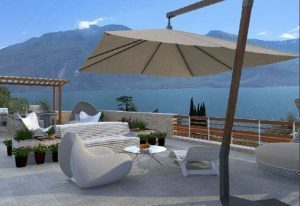 This unique and prestigious development on the lake shores of the historic and lively town of Sarnico, in Lake Iseo strategically just 200 metres from the Lake, is beautifully enhanced by the acres of private park, separate swimming pools for both adults and children and the panoramic lake views. To facilitate the residents there is a cycle path leading directly into the town of Sarnico, and close by is a lido offering football, tennis and basketball, picnic areas and beaches. The accommodations comprise of 2 to 3 bedroom luxury dwellings with 2 bathrooms, boasting ample covered terrace with hardwood pergola or solariums and fully planted garden, again with hardwood pergola. All gardens will be planted with both flowers and plants and in order to facilitate the residents will be totally cared for by the onsite gardener. Every thought has been given to the beauty and security of the luxurious surroundings inclusive of a porter and video surveillance, handy for those residents who wish to use as a holiday location with a ‘lock and leave’ if required. Sarnico is now one of the most attractive tourist resorts on Lake Iseo,The town still retains a medieval structure in a semi-circle to the layout of the ancient city walls. The airport in Orio al Serio in Bergamo offering numerous European flights and destinations is about 30 mins from this location.